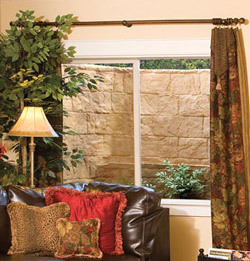 For deeper windows and when egress is required, we offer RockWell™ egress window wells. A single StakWEL module and our EverLast™ crawl space door are a winning combo. Modular StakWEL window wells accommodate a variety of depths, are compliant with egress codes, and offer a dome-shaped cover. A new basement isn’t complete without quality windows and protective window wells. Basement windows can add value to basement environments and provide egress in case of an emergency. Cactus Board offers a complete line of basement windows, as well as window wells and access wells to new home builders and remodelers. These deep (48-in., 60-in., or 72-in.) wells allow for the installation of larger basement windows – an appealing upgrade for every home buyer. The stone impressions on the well liner provide a natural look while the lights and tone still reflect plenty of natural light into the basement interior. The molded wells include an integral step for easy exit (if ever needed). Polycarbonate covers are available for keeping rain, leaves, and debris out. 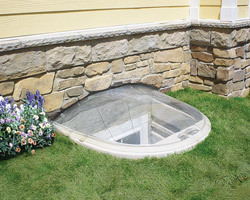 An alternative to the RockWell™ egress window well, this system consists of 21-in.-deep modules. Stack them to create custom depth wells. They are ideal for egress because each module includes a hand grip and step, allowing for easy egress. We call it our Everlast access well because it combines our EverLast™ crawl space door with a single stakWEL module. The 21-in. 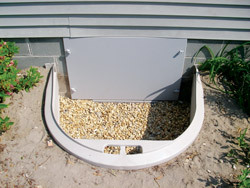 depth provides just enough room for homeowners to enter their crawlspace. When it come's to building a new home, general contractors, like yourselves, may be working with a homeowner that wants to finish their basement or partially finish their basement. That's why it's good to be flexible and offer products such as basement windows and window wells. To order any of the above-mentioned products – or any of our other new construction products -- contact Cactus Board. We’ll be happy to supply our new construction product catalog to licensed home builders.